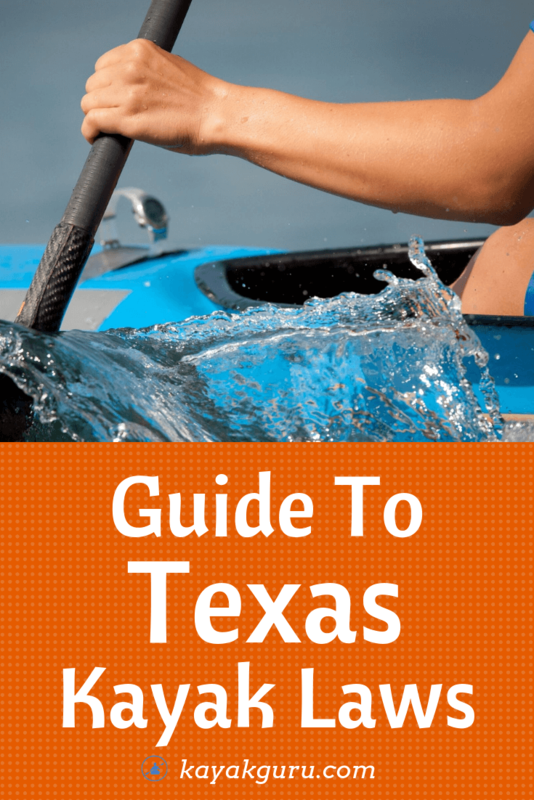 If you’re planning to kayak in Texas, it’s important that you are aware of the state laws and what might legally be required while you’re on the water. While there may be different regulations for different vessels, there are general laws for kayaking and canoeing that can be useful to know before you head out. So to help you stay on the right side of the law, we’ve put together this guide on Texas kayaking laws. What Are The Laws For Kayaking (or boating) In Texas? Regardless of where you’re paddling, if you’re in a kayak, canoe or any other vessel under 16 feet in length you must have a wearable Personal Flotation Device (PFD) on board; one for each person in your vessel. If your craft is longer than 16 feet, it’s necessary for you to also have a throwable flotation device in addition to the wearable ones. All children under the age of 13 must wear a PFD, that’s been approved by the US Coast Guard, while on the water. This law applies to children on vessels under 26 feet and the PFDs must be worn at all times. If you’ve added a motor to your kayak or canoe, it will be considered a motorized vessel. This means that in accordance with Texas law, you will need to register your craft. As well as being required to register your vessel with a motor, it is also necessary to have a safety whistle on board your craft. It is mandatory to have a bright white light on board your vessel if you’re paddling between sunset and sunrise, and preferably one that has a 360 degree visibility. A white light is required by all canoes and kayaks, as well as other manually powered vessels that are on the water at night. While it might seem like the perfect opportunity to kick back and have a beer, drinking alcohol while you are operating a boat is actually against the law. If you’re operating a vessel and are found to have a blood alcohol level above 0.08% then you could find yourself with an up to $2,000 fine and you could end up in jail for up to 180 days - and that’s just for a first conviction. > DUI on a kayak (Worldwide)? What If I Want To Fish From My Kayak? Whether you plan to fish from a pier or your kayak, in order to fish anywhere in Texas you will need a fishing license. There are different licenses for saltwater and freshwater but it’s also possible to combine the two with an all-water package. If you plan to fish in a State Park in Texas then you don’t need to purchase a fishing license, as long as the waters you plan to fish in are completely within the park’s boundaries. If you plan to take your kayak into or out of freshwater zones in Texas there are other rules you have to follow. You must make sure that your craft is fully drained prior to transporting it in order to prevent the spread of invasive species, such as zebra mussels. It’s also necessary for you to clean and dry your vessel and anything else that may have been in contact with the water before you leave. Hopefully you are now fully aware of the regulations for kayaking in Texas, so you should be able to head out on the water legally and, most importantly, safely. Remember, the laws are there in order to keep you and other water users safe. So when you plan your next kayaking trip, make sure you all have your PFDs and if you’re paddling at night, remember your white light! Share this with your fellow Texan paddlers to make sure they all stay safe on the water. And leave us a comment to let us know your thoughts.